In Part 1 I covered the most common knot used to tie a woven or stretchy wrap – the Double knot (Flat Reef or Granny). While the double knot is very secure its not adjustable – if you want to adjust your wrap (maybe to feed, or maybe to alter slightly as baby falls asleep or wakes up) then you might want to an adjustable knot. There are two – the Slip Knot and a Ring Finish. As it’s name suggests the Slip Knot is adjustable – allowing you to loosen and tighten the wrap through the knot as needed while still holding very securely. This knot is made by one end staying dead straight (the passive end – this is the one that will “slip”) while the other end (active) is used to tie 2 looped knots around the straight end. The interesting thing to note that there are actually a staggering 8 ways to tie this knot! Depending on the direction of each of your two looped knots and which end you use as the passive. The important thing to realise is that all 8 variations are “correct”, secure and are slip knots. I say this as someone who spent literally about a month watching and rewatching videos to learn how to tie a slip knot, trying desperately to follow and remember the method and which way to go next without ever understanding how the knot worked. I am convinced I repeated untied perfectly serviceable slip knots just because they didn’t look exactly like the one in the video! This is because to get the classic shape you so often see on videos and instruction manuals you need to tie the second loop in the opposite direction to the first. This is not something most of us do easily… so if it doesn’t come easily to you, don’t fret! Just tie that second loop the same way as the first and you’ll still get a perfectly functional secure slip knot. its pretty! And looks fancy! The disadvantage, however is as both sides do adjust by pulling depending on the width of your ring and how “grippy” verses “slippery” your wrap is you might find the ring finish might loosen off with time so you you might need re-adjust from time to time. Although, if you do find this happening its worth simply switching to a smaller ring diameter. To create you simply pull a loop of fabric though the ring, then thread the other end through the gap created by the loop and the ring together and then pull to tighten up … trapping it between the ring and the first end. The only part to be mindful over is the ring you use. I always advise people purchase rings made for this purpose – rings that are safe for babies to chew on and safe to hold weight with no weak points, no weld and no sharp bits. Sling rings come in 3 sizes – small, medium and large, and generally a medium ring is perfect for most wraps. If you have a particularly thin or thick wrap you might need small or large rings respectively. Didymos are best known for their wonderful woven wraps, and their new half buckle carrier – the DidyKlick – sees them marry wraps and buckles together into one perfect package. I would describe the DidyKlick as a great halfway house between a woven wrap and a buckle carrier. It combines the pros of both – the perfect fit, softness and flexibility of use of the woven wrap combined with the intuitiveness, ease of use, solid waist support and satisfying ‘click’ of a buckle carrier. In fact it does seem almost literally like half and half of each – with the bottom half most resembling a buckle carrier and the top half behaving and feeling more like a wrap. It has a heavily padded waistband that feels very supportive and does a great job of taking the weight off of the shoulders and onto the hips and waist. The buckle is to one side and tightens in one direction only. So very easy to use and very secure. Although I have to say I personally don’t like having the buckle to one side as much as central but that’s a very personal thing! I know other people who find it easier at the side. For the baby the panel adjusts in two ways. Firstly the overall width of the seat can be adjusted via velcro attachment to the waist band.. the whole thing can be scrunched down to fit a smaller baby or pulled taut for a bigger child. I was really impressed by just how big a size range it covers. There are no preset ‘jumps’ its possible to get an exact knee to knee fit all the way from a tiny baby to bigger toddler. There is also a drawstring to help make a pouch for a smaller baby. I would say realistic age range would be a month or two all the way to at least 3 years old. In fact I was honestly staggered to find it gave a reasonably good fit for my 4.5 year old and he certainly found it comfortable! While the panel doesn’t adjust in height, it is possible to adjust the height by altering how you put the baby in – putting a smaller baby in deeper to shorten the panel and visa versa sitting an older child directly above the waist band to lengthen the panel. For me this is the one thing I’d like to see altered about this carrier – the width adjustment is really amazing and covers such a range, it would be absolutely brilliant if the height adjusted to the same extent and as smoothly. However, this really is quite a nitpicky thing, it works absolutely fine without it! The hood, however, does adjust smoothly and attaches via loops onto the straps, with simply to use poppers to secure. I love that the loops have been included on both sides of the straps so it’s possible to purposefully twist the straps if desired. The straps are what really makes this carrier so comfortable and fit your body like a glove. Made from wrap fabric they just hug your body and go where you want them too! Like them really spread out? Or prefer them bunched up? You choose! You have complete flexibility to do what you like just as you would with a wrap. As mentioned you can even purposefully twist the straps – which seems like an odd thing to do but something I often teach to parents with nosy babies as it gives babies more space to see things while still giving great support and comfort for the parent’s shoulders. In terms of length the straps were plenty long enough to come round under babies bottom and back behind me to tie, but not so insanely long that i couldn’t tie in front with bow if I didn’t want a knot in my back (i.e. for sitting down). But what’s really fab about this carrier is the flexibility of its use. As well as covering a huge age range it offers 4 carrying positions. Front, Hip, Back and even a Onbuhimo style carry. 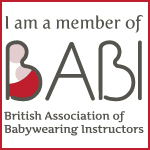 Most buckle and half buckle carriers offer the front, hip and back carry positions and while front and back are usually pretty straightforward the hip position is often less comfortable or more of a faff. This is not the case with the DidyKlick, the hip position is every bit as comfy, mainly because there are no bulky straps to get in the way – the wrap straps can be adjusted perfectly to make this position really work. Which is great as a hip carry is a great option for a nosy baby or in our case one who wants to ‘help’ with dinner. Additionally the instructions for this position are really good and easy to follow, making it really easy for someone new to carriers to pick up. Likewise the back carry position is really easy and straightforward to do, and the long straps give you lots of flexibility to tie how you find comfortable or even play around with fancy tie-offs! But it was the Onbuhimo carry that really fascinated me. You see an Onbuhimo is a totally different type of carrier entirely – originating from Japan, Onbuhimos are a waist bandless carrier used for wearing baby high on the back, just like a rucksack. I have only ever tried one once before and don’t currently have one in the library currently as I see them as quite specialist… they work best for older babies and I see them as great for people who are pregnant or for some other reason don’t want to have a waist band. I thought about purchasing one when I was pregnant but it seemed like a waste as I would only use it for such a short time. So what really fascinates me about the fact the DidyKlick can be converted into an Onbuhimo style carrier is that you can use the Klick as a half buckle on front, hip and back in half buckle mode as usual with baby number 1 from 1-2 months through to todderhood, and then continue to carry through-out pregnancy with baby number 2 in Onbuhimo mode before using the Klick as a half buckle all over again with baby number 2 and likewise for any more children… all the way until you no longer need to carry. The flexibility of this carrier is just amazing! Plus I really loved the Onbuhimo mode as I could get such a high back carry with my daughter that we could just chat over my shoulder. And even without a waistband it was so comfortable, and light and easy! To convert into an Onbuhimo style carrier, you simply remove the waistband from the panel and instead loop the long straps through the waistband pocket. From there I simply followed this video. I have to say the setup was a bit of a faff, as was re threading the waistband later so I probably wouldn’t want to be switching between these two modes all the time, but switching only occasionally while pregnant or for the middle of summer when you want a lighter, higher back carrier etc, I could definitely see. All in all the DidyKlick is an absolutely fabulous carrier. I wouldn’t hesitate to recommend it to anyone looking for one carrier that will last them a long time because not only does it realistically fit from 1-2 months all the way to 3 or 4 years of age, but it also offers such flexibility of use with 4 different carrying positions that it caters beautifully for different developmental stages and phases. Plus, like all Didymos slings, the Klick is really well made and designed to last so really can grow with your family as your family grows. Additionally, I can see this carrier working particularly well for anyone with a history of back pain, and for families with very different sized partners – because the exact fit provided by the wrap strap shoulder ties allow for perfect weight distribution and a super comfy perfect fit every time regardless of who wore the carrier last. Woven FAQ – What does gsm mean? How thick or thin is that? What does gsm mean? How thick or thin is that? One way to easily visualise this to compare knot sizes – the thicker the wrap the bigger the knot! For a first wrap, I would start with a thin-medium wrap, something in the 200-260 gsm range. Thicker wraps are generally tougher to tighten if your new to wrapping and a bit inundating with a little baby. They do have their advantages – thicker wraps are often more supportive and can be more forgiving of a sloppy wrap job, but the extra thickness and weight can be a bit warm and get in the way while you’re learning or feel like your wrestling to get the wrap done up in the first place! Conversely, while very thin wraps are much cooler they can require you to be very precise in your technique to prevent the wrap either digging or sagging, especially as your child grows… so something in the middle gives you the best of both worlds and should work well all the way from tiny baby to bigger child. That said gsm isn’t the be all and end all, the weave of a wrap can have a big impact too. At 260 gsm my Firespiral alchemy weave Librarian is right at the upper end of midweight but its loose weave means it behaves like a thinner wrap – easy to tighten, very comfy and very breathable, so not at all hot. In fact while in general thinner wraps will feel cooler than thicker wraps, weave can play just as an important role … i.e. my Didymos Lisca and my Girasol Earthy Rainbow are both 215 gsm but the Lisca with its herringbone weave feels like a smooshy warm blanket while the Girasol feels thinner and cooler. Finally, when considering thickness, consider also your chosen length and what you intend to do with this wrap. If you are getting a base size wrap to do carries with multiple passes around you and baby, err on the thinner side as those extra wraps around each of you will heat you up! However, if your going for a shorter wrap – thicker wraps are stronger and will feel more supportive in a single layer carry like a simple ruck. (Note all gsm quoted above are measured by me post wash and wear. Wraps do shrink a little after their first wash and in fact stretch out with use and spring back in the wash,.. so true gsm will fluctuate a little and may well differ from the loom state gsm published by the manufacturer. I.e. Didymos Rosalinde is quoted at 180gsm but post wash and wear it measures at 190gsm).